This book is written in the same fashion as Big Red Kangaroo and Emu (two other great books to learn about Australian animals). Each tells the story about a particular animal and then has side notes with facts about the species. 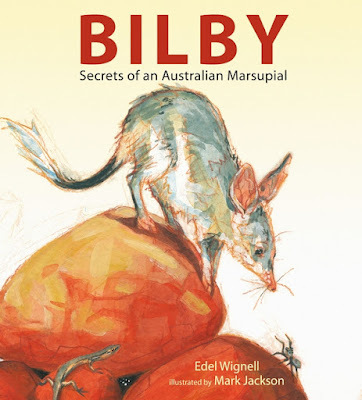 In Bilby the story is about a mother and her young baby. The reader learns about the baby's life from birth to being ready to be on his own. It is full of so much information but is presented in a fun and easy to understand manner. 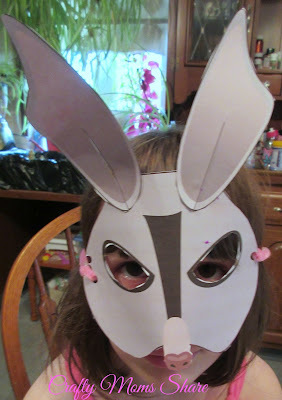 I did not know much about a bilby, but it was fun to learn. Their pouches are backwards so dirt does not get at the baby when the mother is digging. They dig and hop a lot. Many Australians believe that the Easter Bilby comes instead of the Easter Bunny. I found a great resource of activities including this great printable mask over at Mother Natured: Celebrate National Bilby Day with Ten Activities for Kids. Hazel was of course happy to model it for me. The book taught us about this amazing animal and we really enjoyed reading it. It is definitely one we want to keep. 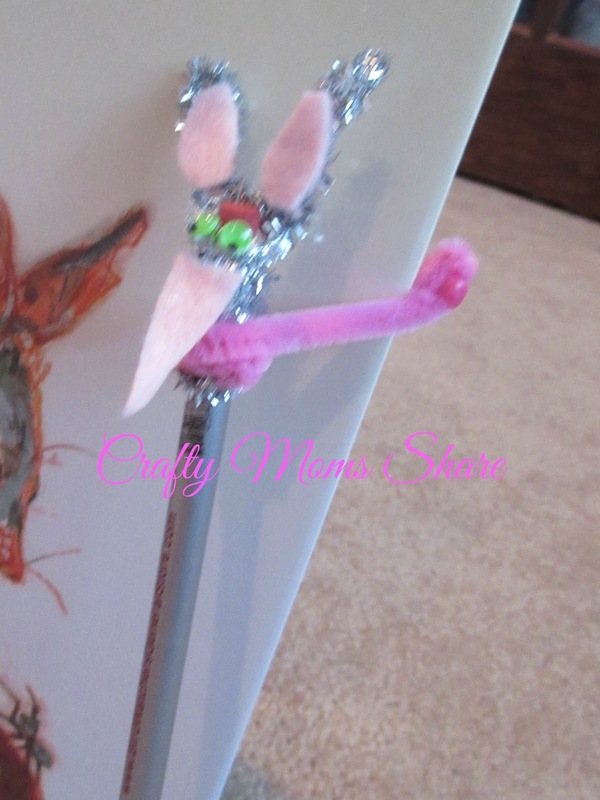 I also made Hazel a bilby pencil topper following the instructions at Our Worldwide Classroom: The Bilbies First Easter Activities. 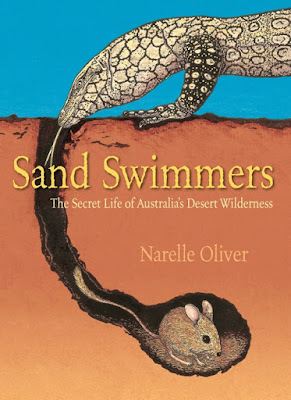 Our second book is Sand Swimmers: The Secret Life of Australia's Desert Wilderness by Narelle Oliver. This book has so many great ways to use it. It is written telling what the first European explorers would have found and had difficulty surviving as well as about the life of that is in the desert and the Aboriginals that learned to live there. It also goes into the history of what the area looked like before man. Although we did not focus much on the explorers, there names are used throughout the story. Hazel's favorite part was learning about the various types of animals there. Animals like the honey ants, bilby, bearded dragon and shield shrimp. The story goes through the parts of the desert each animal can be found and where they live in that part. Some of the illustrations in the book have a large colored picture with animals that camouflage themselves well. There is a smaller rectangle of the animals in color on the black and white background with letters to identify each specie. Hazel loved this part. She loved finding each hidden animal. Throughout the book there are maps of the desert to see where the explorers traveled as well and quotes from their own records of the exploration. 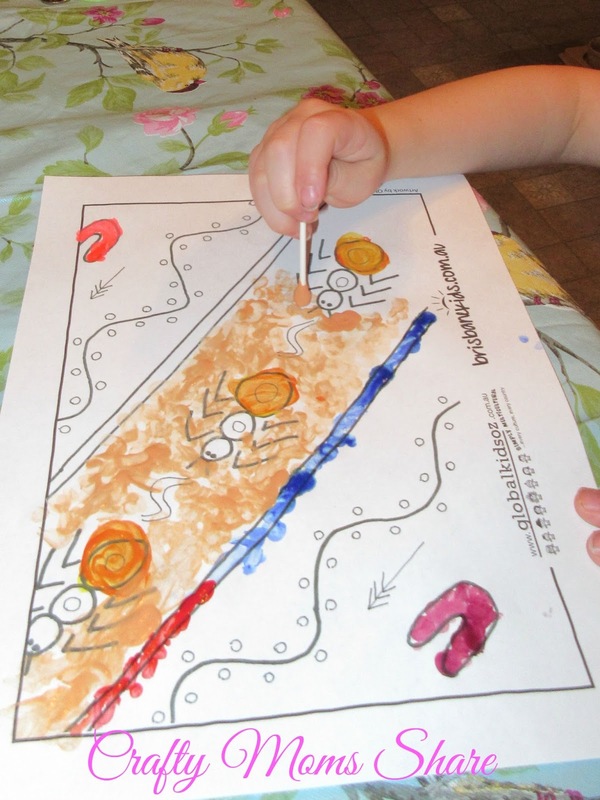 I printed some activities for Hazel about some of the animals. 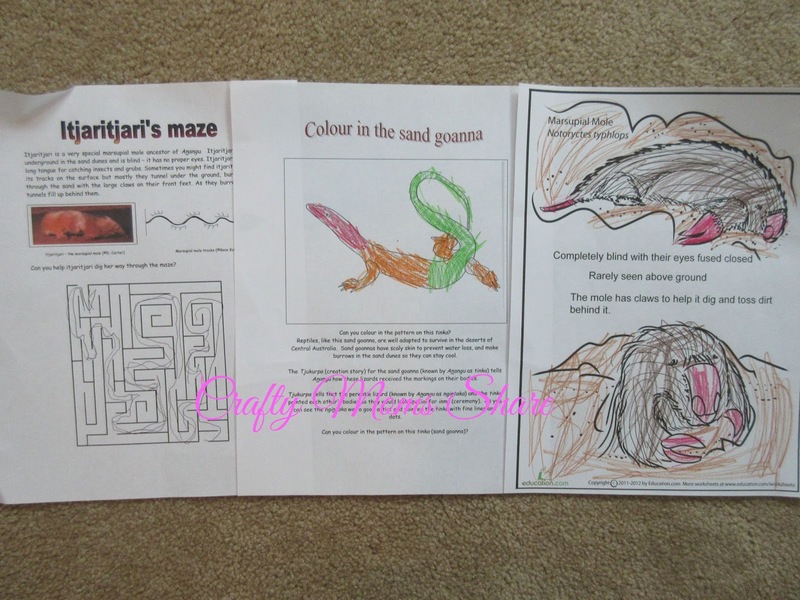 The first two came from the downloadable file from Uluru-Kata Tjuta National Park. The last came from Education.com. 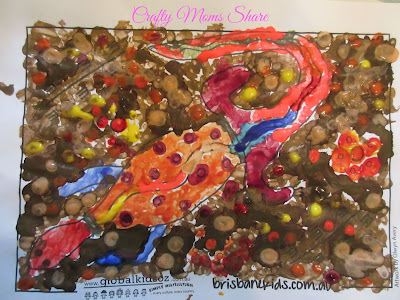 We also made some Aboriginal style dot paintings. I printed out a couple of the pages from Brisbane Kids: Aboriginal Colouring Pages. Then we used cotton swabs to paint. 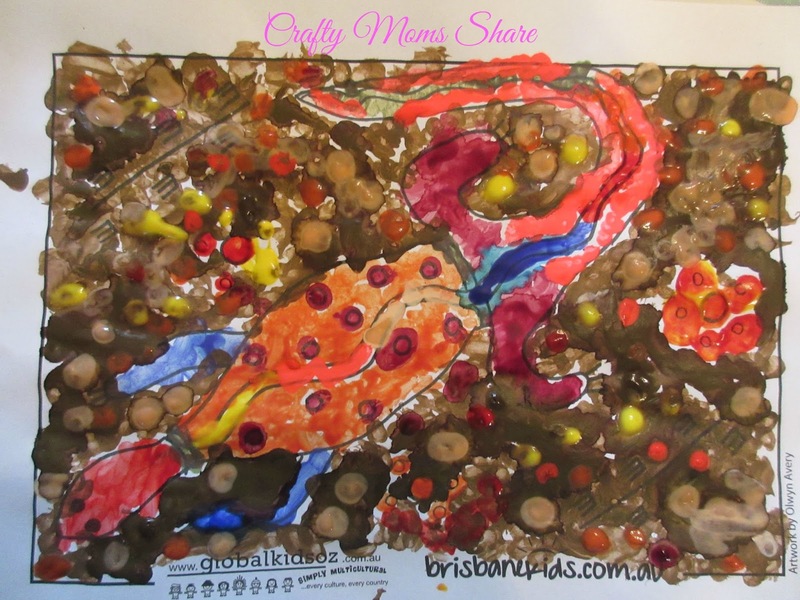 Hazel wanted to make the honey ants and I did a goanna. 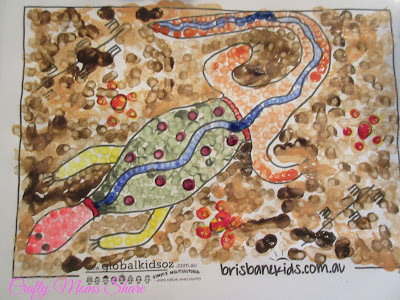 Then later Hazel wanted to make a goanna, so I let her do one as well. 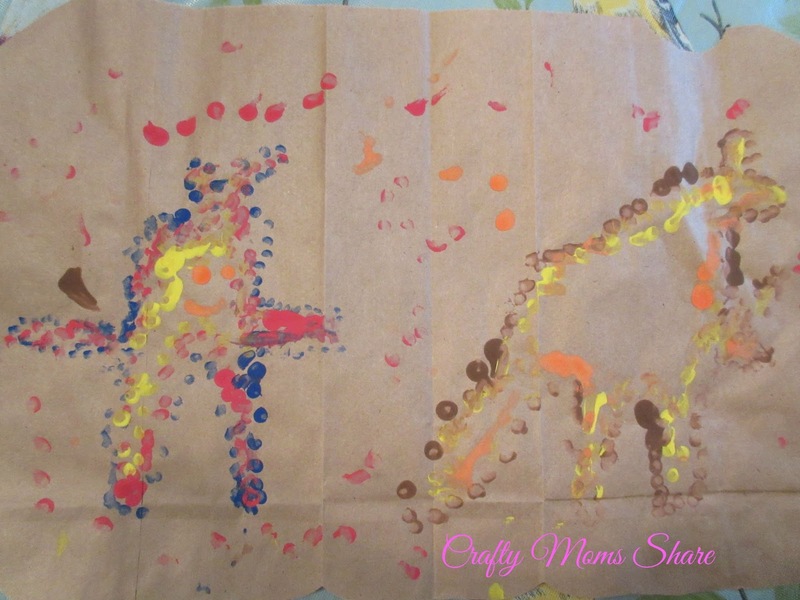 Hazel liked mixing colors on the painting so the dots do not show up as much. 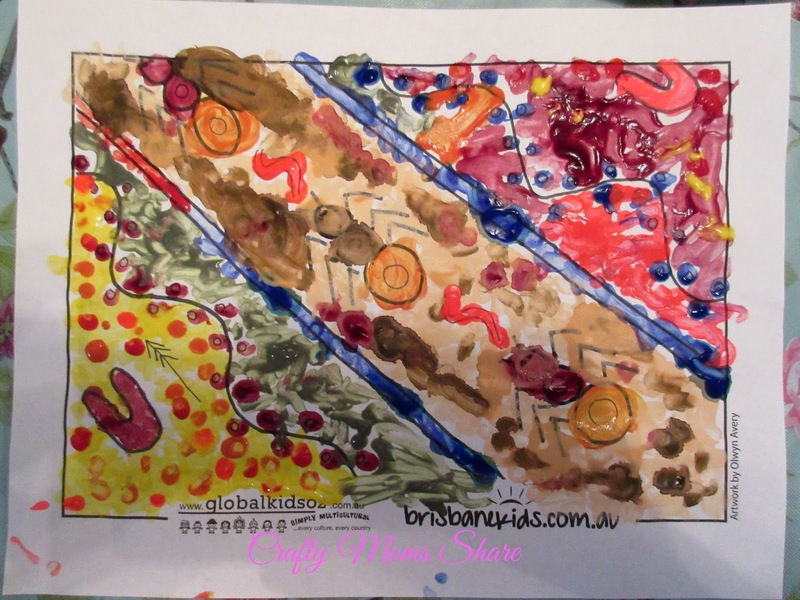 However she remembered making dot paintings at school when they learned about Australia. Here is hers from school. We have a love for learning about Australia. It started at a young age with Hazel's first pen pal being in Australia (the son of Kelly at Happy Whimsical Hearts). 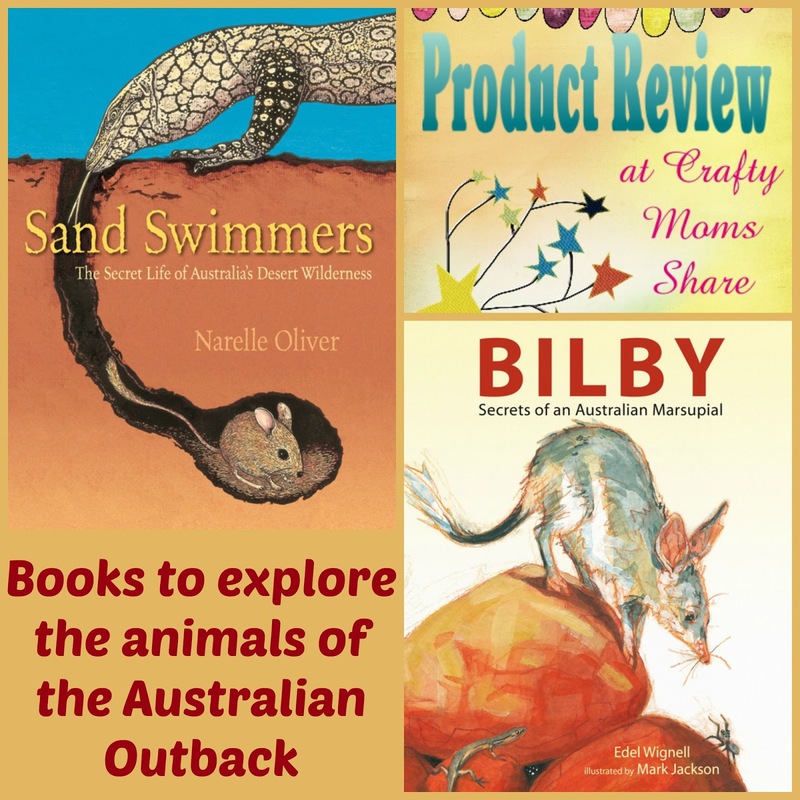 Needless to say we love reviewing books about Australia and these books are no exception. They combine two of Hazel's favorite things to learn about--Australia and animals. They are fun to read and have so much information packed into them. Hazel loved bringing several of the books we previously reviewed about Australia and items sent to her from her pen pal into school when they learned about Australia in class. Thanks to Candlewick and to Kelly for providing them all for us!